The European Union and several other governments released a statement on Monday, calling on Sri Lanka to halt steps towards reinstating the death penalty, stating it was an “unacceptable denial of human dignity and integrity”. 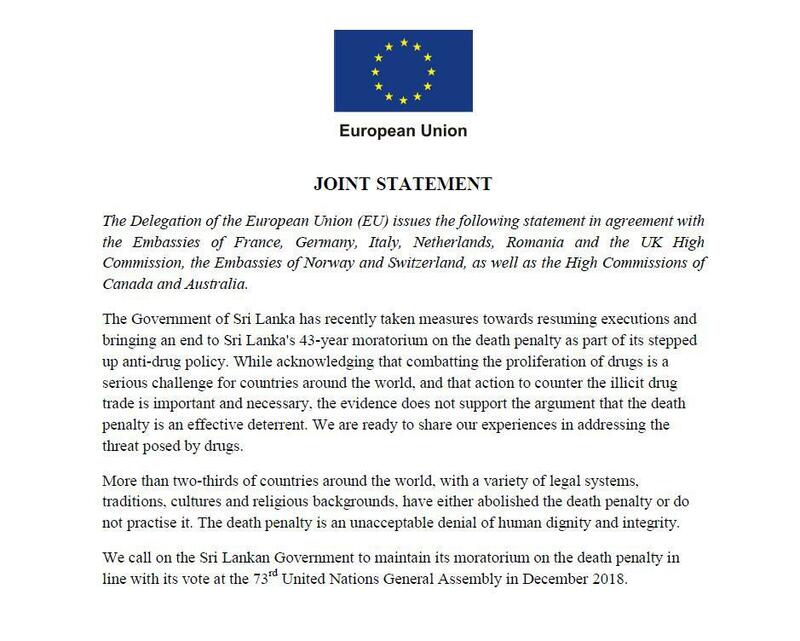 The statement, which was issued in agreement with the embassies of France, Germany, Italy, Netherlands, Romania, Norway, Switzerland, Canada, Australia and the UK, called on the Sri Lankan government to “maintain its moratorium on the death penalty”. “The death penalty does not solve this or other social problems in any society,” tweeted current British High Commissioner James Dauris. See the full text of the statement below. Last week the Sri Lankan government was reported to be seeking international assistance in training new executioners, as the government geared towards re-implementing the death penalty. Meanwhile, Amnesty International reported that “people who are from less advantaged socioeconomic backgrounds, or belonging to racial, ethnic or religious minorities, are disproportionately vulnerable to being sentenced to death” in a briefing released last week.